Daddy comes to the rescue again as a midnight swap is arranged with the other bunny, the other little girl, and the other daddy. Needless to say, the daddies are not very happy. By the end of the story Trixie has her beloved bunny back, but she has also gained something new: her very first best friend. 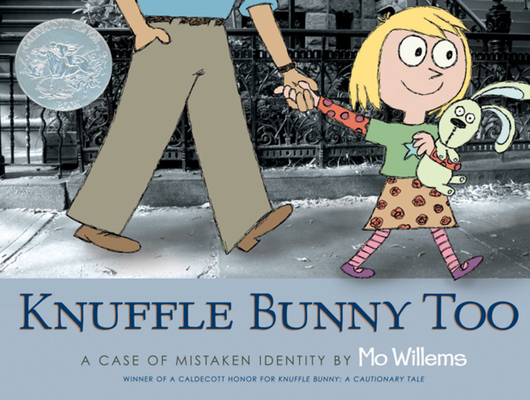 In the tradition of the Caldecott Honor-winner KNUFFLE BUNNY: A CAUTIONARY TALE, this is another heartfelt, hilarious picture book that children (and their parents) will love. Mo Willems is the author of groundbreaking picture books, including; Knuffle Bunny: A Cautionary Tale (Caldecott Honor winner 2004); Don't Let the Pigeon Drive the Bus! (Caldecott Honor winner 2003); Don't Let the Pigeon Stay up Late! ; The Pigeon Finds a Hot Dog! ; Time to Say "Please"! ; Leonardo, the Terrible Monster; and Edwina, the Dinosaur Who Didn't Know She Was Extinct.